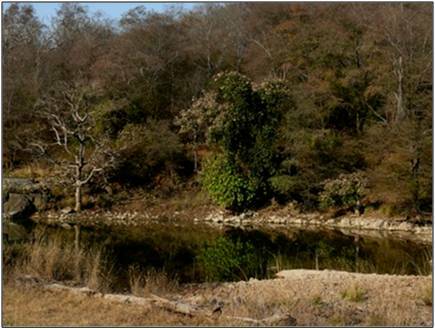 Ranthambhore is the meeting points of two hill ranges- Arvalli hills and Vindhyan Hill system. Ranthambhore is the last home of tigers in this Dry deciduous dhonk (Anogeissus pendual) forest, which comprises of deep valley called "khos" and hilly table tops called 'dangs'. All the Khos have natural perennial and seasonal water streams. Only two months of summer are water scarcity period for Ranthambhore. This is the time when nature eliminates the weaker population of wild animals naturally. But there are many of the natural water holes which have water for these critical months too. Impact of climate change cannot be ruled out but the forest department is making simple water holes which is fulfilling the need. Recently, the forest department started making exuberant number of water shed program in the small park. They have already constructed more than 100 small anicuts and 20 Telais (ponds) in the park in a period of 3 years. This time they are planing some 20 big size dams each costing 35 lac to 75 lac rupees. Old tiger Champion late Shri Fateh Singh Rathore always objected on this kind of disturbance inside the natural ecosystem of Ranthambhore. Sadly, he was completely ignored by forest department. Heavy excavator machines, pneumatic drills and blasting for this construction are creating immense stress for wild the animals. The ecosystem of Ranthambhore is very fragile the temperature and rainfall in this place is in the extremes hence the evolution of the plants and animals in this region is according to the xeric conditions. If we do any manipulation in this we will end up with some irreversible damage. Irrigation and Forest department both are involved in this construction and NREG/ NABARD schemes funding the projects. 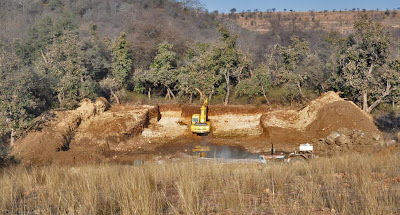 In the last few months there has been an alarming amount of construction work and earth moving disturbance inside Ranthambhore National Park. In particular a number of cement annicuts and earth dams have been constructed around GALAI SAGAR. 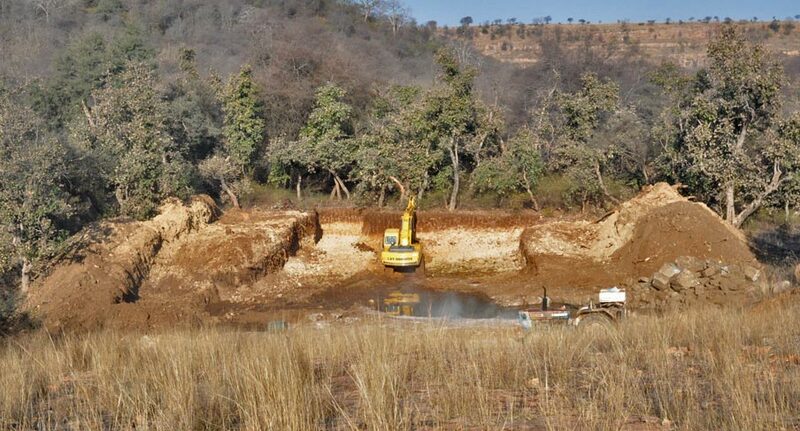 It is feared that this will affect the water-holding of this lake, in an area where there are a number of resident tigers including a tigress with cubs.. The TAMBAKHAN road has also been gouged out and widened with a JCB, apparently to facilitate use of this road by tourist vehicles going to ‘Zone 4’. 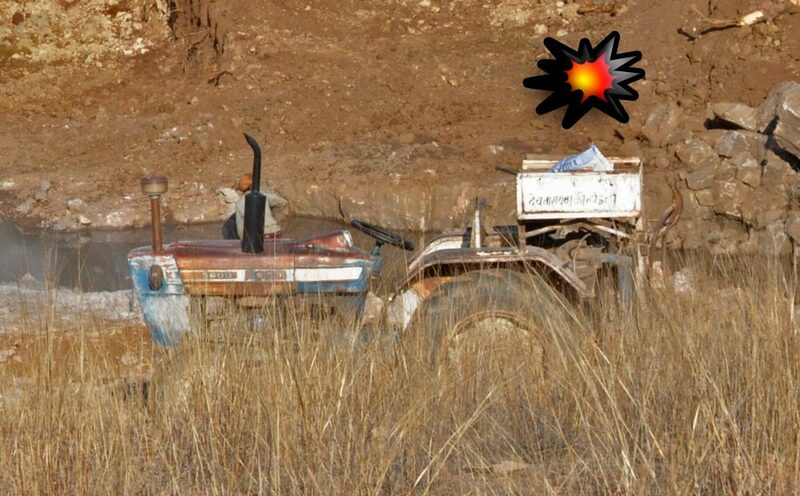 Just short of Tambakhan, large areas of earth have been removed by a JCB for road building. 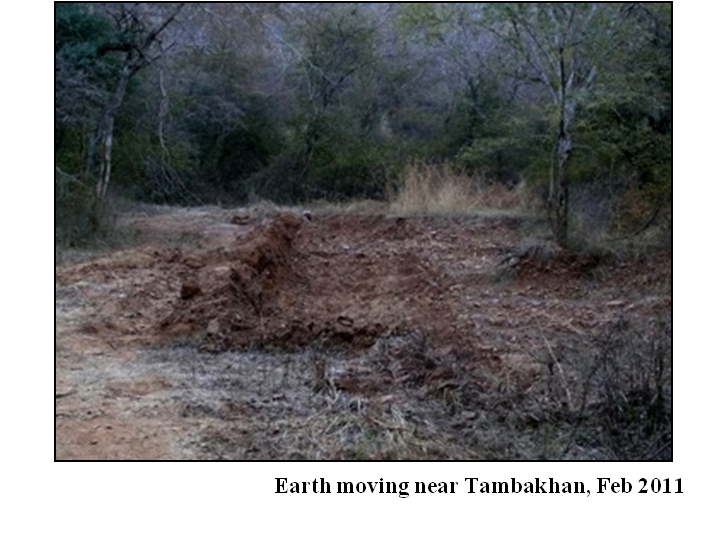 These negative intrusions are totally unnecessary and will cause untold damage to the delicate balance of Ranthambhore’s habitat. 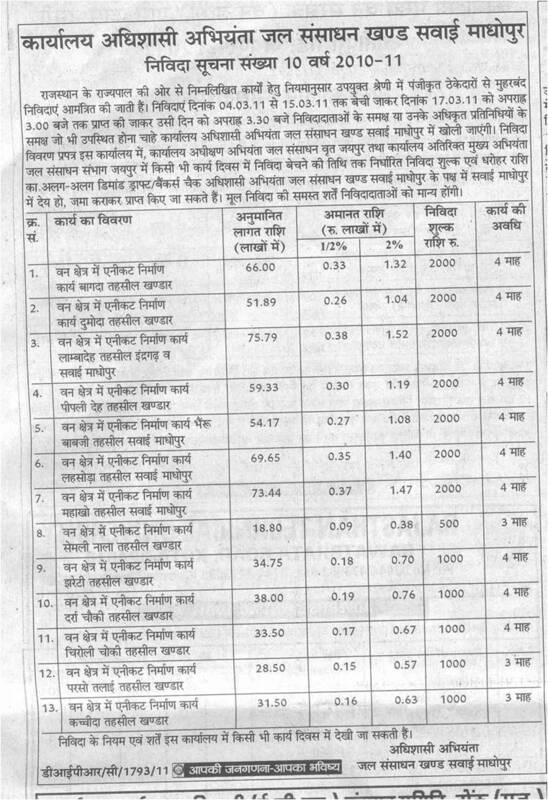 Pic: Tender notice showing a list of proposed sites, while constrcution of 6 dams are already in process. Pic: A proposed annicut at ADI DAGAR, beyond Lakardah, in a nullah that runs from Lakardah to Bakola. 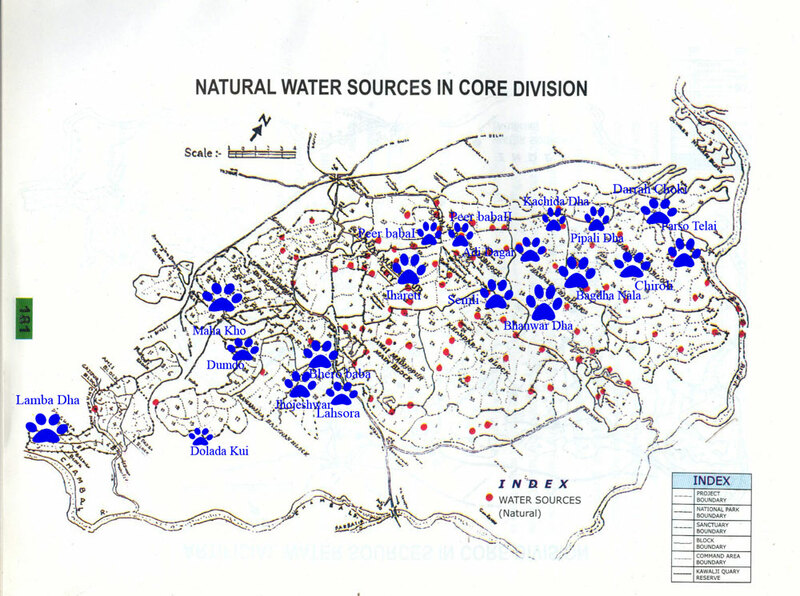 It has a number of perennial waterholes that provide water to wildlife, especially during the critical summer months. 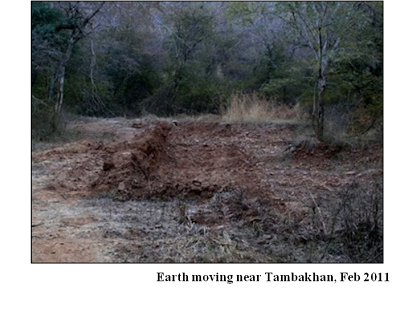 This is where the tigress ‘Machali’ (T-16) spent the summer of 2010, making kills around the waterhole. 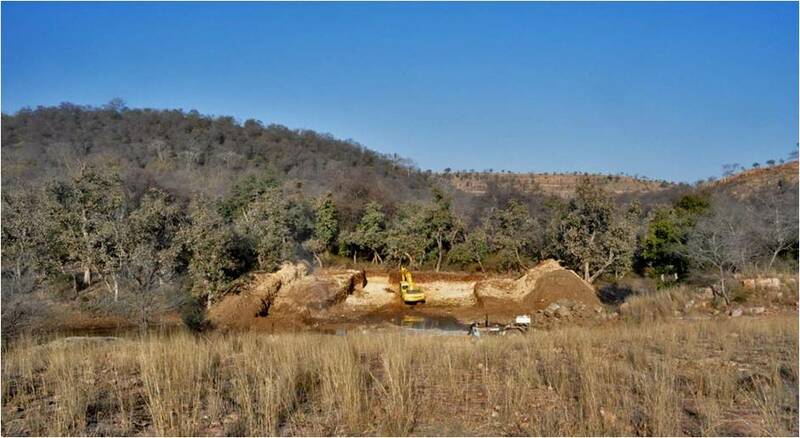 Pic: Apart from irreparably damaging the natural, all-season Adi Dagar waterhole, the proposed annicut will inundate the surrounding rock walls that are home to a host of wildlife, including monitor lizards, mongooses, and owls. The proposed construction outlines of the annicut can be seen above. Pic: Five hundred yards away is another waterhole. The proposed annicut will also destroy this second deep perennial pool. A cement annicut at this site is unnecessary and will be extremely destructive. 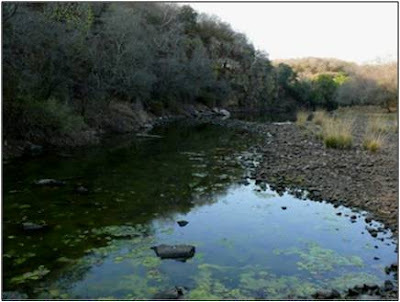 Pic: At ADI DAANT there is another important perennial waterhole that falls into BAKOLA. It will most likely dry out if the proposed annicut is constructed. Pic: Another annicut (see construction outlines above) is planned in the BERDAH area. 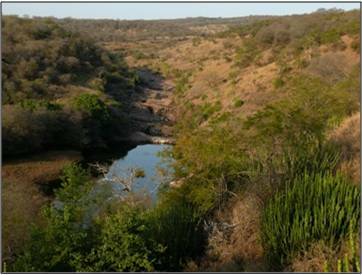 The site, called BHANWAR DEH, is a critical perennial waterhole that has probably existed for hundreds of years. Pic: This deep pool is marked to become the tail end of the Bhanwar Deh annciut, which would most likely destroy this vital all-season waterhole. All the proposed and in execution areas are breeding valley of the tigers. These dams will ruined them completely. During the construction the will lead to tigers moving out, from these territories. Which is already started happening. 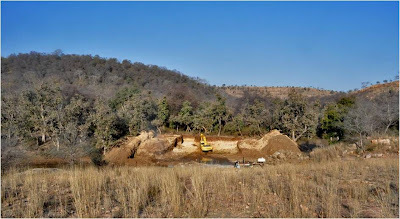 Heavy excavator machines, pneumatic drills and blasting for the construction are creating immense stress for wild the animals in that area. 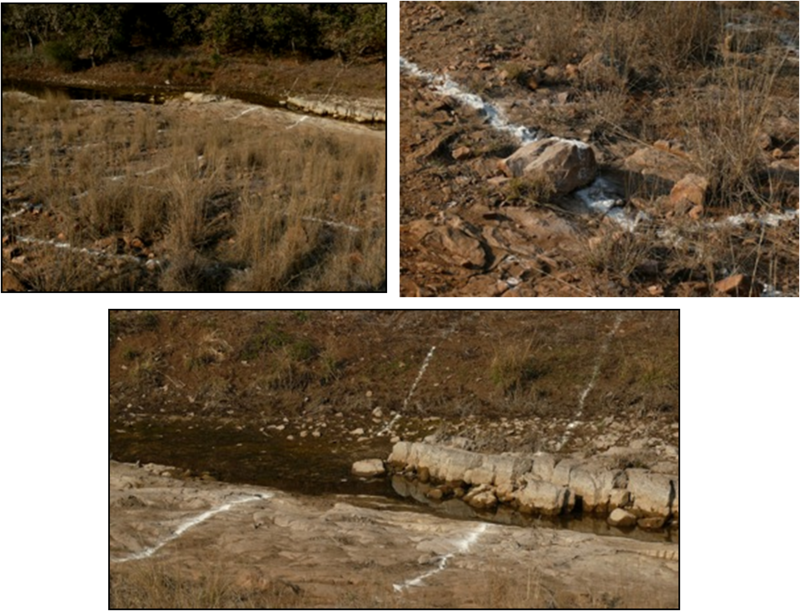 The soil texture of the area does not support water retention; impact – the water will stay just for 3-4 months and not during the steep summer season. And during the water holding days they will spoil this fragile ecosystem – the Dhonk (Anugesus pendula) will wear away. The flora of this xeric and arid environment when exposed to excess water get damaged. Eg: the dhonk tree (Anogeissus pendula) is the main tree of this area. When it receives water in the non-water months it gets damaged and dies out. When the dhonk in the valleys get over, it affects gravely the fodder availability in the area as they shed the last and in the hot summer months this is the only tree leaving out fodder for the ungulates. The dang dhonk on the other hand sheds the leaves earlier and by then also the grass dries and becomes more fibrous and unpalatable, so in these steep months only the fodder of the valley's dhonk is available for all the animals. Similarly the fauna too is affected, the moisture content of the soil increases which disturbs the burrowing animals largely. These burrowing animals are the base of the food cycle as they affect all the small cats like caracal, jungle cats also the raptors etc. This will have great impact on the ground birds such as the quails and partridges which primarily prefer this dry ecosystem. It is hence possible that with such irresponsible moves made by us we may destroy the last holding grounds of the elusive species like the caracal and other small cats. Sometimes, these altered habitats attract exotic species and create menace for the region - It is possible that due to this the excessive water some other pest rodent may arrive and replace the natives, this pest can possibly damage the natural seed stock. In the same way exotic plant species can also increase in the region. The dam and anicut constructions are close to the natural water points which will eventually lead to silting, this would choke the water flow and sooner or later the natural water body will be finished. At the moment with the strong flow the leaf litter and soil flushes out due to the water pressure. The best example of this is the Adidant nallah. All the construction is done with the use of huge excavators, JCB machines and pneumatic drills causing noise pollution and turbulence which fundamentally causes disturbance in the wildlife of the area. 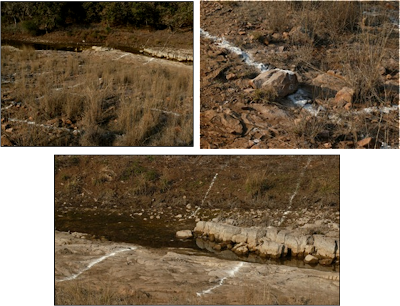 The Ranthambhore 10 year management plan mentions that these kind of water anicuts construction should be of loose stones and grass bed on top for holding the water. The Hon. Supreme court's order 14/2/2000 in IA no. 158, which has peremptory to not have any construction inside the park without its approval, however this directive has been disregarded several times resulting in unwanted structures like anicuts, guard posts, roads etc. Such habitat alteration require rigorous scientific protocols and sound environment impact assessment before any slapdash constructions. very sad state... Even in karnataka forest , they have started these activities, displacing the tribal people from forest, fencing the boundaries without proper cencus. Very well written and quite informative..It will definitely have a big impact on the ecosystem.. 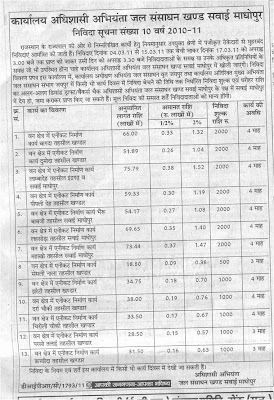 But what I understand from it is that, as its the Financial Year ending, the Forest Deptt needs to show where the money from Govt. and from Donations was spent thats one reason why the work starts in such a hurry!!! its same in Kanha and I believe elsewhere too!!! 20% spent on work, 80% fills the pockets of rangers!!! Forest Deptt. have cancel all this now. This is what I have heard. Please correct me if I have wrong info.